The following post appeared on BAH on 5 August 2009. Breakfast at our house is usually pretty routine. I make a batch of Alton Brown’s Overnight Oatmeal once a week. And I alternate that with some of SFC’s Not Quite Scrambled Eggs. They’re a cross between scrambled and over hard. Difficult to explain but very enjoyable to eat. Or, if I’m short on time in the morning, I’ll toast an English Muffin and make a breakfast sandwich with a Morningstar Farms Veggie Sausage. But every so often, I get a taste for pancakes. Most recently, this came while I was going through the July/August Cook’s Illustrated. Page 23 promised the Best Buttermilk Pancakes. I happened to have both buttermilk and sour cream, which the recipe called for, so I figured it was a sign that I should heat up the griddle. Overall, it’s a solid recipe, although I found the batter to be too thick. My first batch of pancakes did not spread on the griddle. This led to the inside being gummy and undercooked when the outside was nicely browned. I added just enough buttermilk (maybe a quarter cup or so) to thin out the batter so that it spread into lovely rounds on the got griddle. My only other problem was that even though I had scaled their recipe in half, I was still left with too many pancakes to eat in one sitting. So I wrapped the leftovers in paper towels to absorb moisture as they cooled and set them in the refrigerator. Once fully cooled, I transferred them to a plastic bag for short term storage. Now if you’ll excuse me, I’ve got to introduce the Best Buttermilk Pancakes to a slice of spiral cut smoked ham for a late night snack. Wrapped in plastic wrap, you could also freeze any leftover pancakes once fully cooled. Reheat in the toaster. According to the recipe, this will make sixteen 4 inch pancakes, serving 4 to 6. Whisk flour, sugar salt, baking powder, and baking soda together in a medium bowl. Whisk together buttermilk, sour cream, eggs, and melted butter in a second bowl. Make a well in the center of the dry ingredients and pour in the buttermilk mixture. Stir until just combined. The batter should remain lumpy. Do not overmix. Allow the batter to sit for 10 minutes before cooking. Heat 1 teaspoon oil in a large nonstick skillet over medium heat. Using paper towels, carefully wipe out the oil, leaving a thin film on the bottom of the pan. Pour the batter, 1/4 cup at a time, onto the skillet. Cook until the edges are set, the first side is golden brown, and bubbles on the surface are just beginning to break, approximately 2 to 3 minutes. 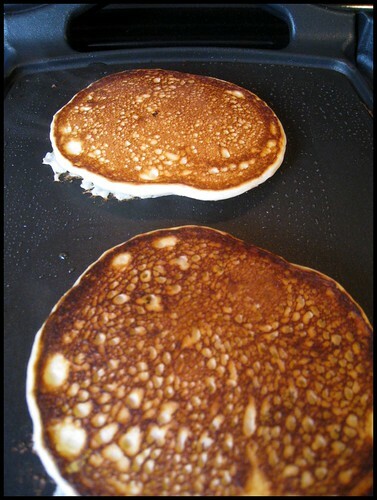 Flip the pancakes and cook until the second side is golden brown, about 1 to 2 minutes longer . Serve immediately or transfer to a wire rack set inside a baking sheet in a 200 degree oven. Repeat with remaining batter, using remaining oil as necessary.